Bhakti Fest is considered the ultimate playground for yogis. In particular, for bhaktas (devotional yogis). While Bhakti Fest 2018’s Joshua Tree desert playground may span 385 acres, this year I was attracted to a tiny outdoor classroom next to a small artificial pond. Sitting on the sandy ground, or perched at the rim of the pond, a variety of singers, drummers and musicians shared knowledge and tips about their practices. Of note, chanting improves heart rate variability. in other words, chant from your heart, and you’ll be chanting FOR your heart, and general well being. Bhakti Fest’s Kirtan School spanned only four days, with two two-hour sessions daily. Each class had a different lead teacher for a great potpourri of kirtan key take aways. As Gina Salá, one of the teachers said, “So many mantras. So much wisdom.” I’d add, So many artists. So much devotion. For the culmination of so much sangha (association/unity) of sound. In a previous article of mine, Gina Salá spoke about music and devotion. A take away was that every voice is divine. Perfect. Most noteworthy, Girish spoke of the science behind chanting. There is clear data to attest to the benefits of singing kirtan or chanting in groups, in particular. In fact, a recent study completed by the University of Gothenburg in Sweden noted that those who sang together had synchronized heartbeats. The head researcher explained that singing is a form of controlled breathing, not unlike yogic breathwork which leads to many benefits, including lung capacity and heart health. Furthermore, Girish said, “When we sing in a group, our brain waves start to sync up. And heart beats too.” He talks about the phenomena called heart brain coherence, which has been investigated by the HeartMath Institute in California, and heart rate variability (HRV). “We want a more adaptable heart rhythm,” added Girish, “as HRV is a biomarker of human health. One fantastic way to increase our HRV levels — and thus our overall health and resiliency — is to sing. And, in fact, chanting mantras increases HRV levels better than any other types of singing.” Again, Girish has scientific research to back this up. He explains that when you chant mantras, you follow a particular breathing pattern as referenced in the Swedish study. Clearly, the breathwork associated with Tibetan monks is far from that of acid rock. While there’s plenty of evidence-based insights as to why it works, when you look at a toddler or child singing a nursery rhyme, it’s pretty obvious. Singing, especially repetitive sounds, makes us feel good. “The primal human instrument is the voice. You don’t have to go to a music school to find out where a middle C is,” said Girish. Shiva Rae, also at Bhakti Fest 2018, told an intimate gathering of women there, “Your first mantra was in your mother’s womb (her hearbeat).” And, in many cultures, the drum represents the heart beat. For the Mayapuris, the drum represents the sacred, too. In their Kirtan Class, the close-knit bhaktas from Florida explained the essence of the primal beats and their beloved mridanga. “The drum is a manifestation of Balaram (Krishna’s brother). Sound vibration itself represents the lord. When we use our instruments in Kirtan we are dressing (up) the holy name, and the instruments are the decoration to attract us. The more that we offer our love, the more we will feel the syncopation,” they said. This entry was posted in Festivals & Events, Kirtan & Bhakti, Therapy & Benefits on October 10, 2018 by thenamas. Bhagavan Das left the United States in 1968. At the age of 18, he headed east. To India. Tibet. Nepal. With no money. He adhered to the customs of the elder yogis. A renunciate. An ascetic, or sadhu. After seven years, he returned to the States. But not to the lifestyle of the ordinary American. He introduced a friend to one of his gurus, Neem Karoli Baba. That friend is now known as Ram Dass, author of “Be Here Now.” Bhagavan Das authored his own book, “It’s Here Now (Are You? )”, but is better known for his music. In each of his CDs, his chanting is almost spellbinding. Rather drone-like, his concentration on the mantras or prayers is as solid as the Tibetan monks with whom he was guided many years ago. Today, he doesn’t look like your card carrying AARP man. No Bermuda shorts. He walks barefoot, rather than gym shoes and calf-high socks. Nor does he sport a golf shirt. Rather, he wraps a long white robe around his 6’5” lean body. Yes, he has the grey hairs and receding hairline. But, his white beard reaches almost to his belly. Trailing from the back of his head is one grayish-brown dreadlock that extends to his upper thighs. Sometimes, he wraps the dread around his head turban-like. In his white robe, he looks a bit like what you’d expect an aging Moses to look like. Weathered. Coming down from the mountains. Yes, weathered but wise. His music is mesmerizing. Usually, he belts out verse in Sanskrit. At times, he interposes English. One hand is glued to his one-stringed ektara. His deep booming voice resonates well with the sitar, and other instruments from the Indo-Pakistani region. Bhagavan Das’ spoken messages are sparse, but have maximum impact. Next, he continues his story about the sages who formed a circle around the earth. The goddess Durga, who takes away the darkness was coming to the rescue. She was trying to slay the dragon. But alas, every time she struck to whack off the head of the dragon, another head would arise while blood was spurting all over. It had been many years since Bhagavan Das graced the stage there. He was at the first Joshua Tree mega-yoga/music festival, ten years ago. While some kirtan artists live on the road, like vagabond musicians, performing at yoga studios and festivals across the country, and even overseas, that’s not Bhagavan Das’ gig any more. So Bhakti Fest 2018 attendees were in for a real treat this last September as one of the earliest American kirtaneers shared his music, and his wisdom. In an interview more than a decade ago with “Time Out New York,” Bhagavan Das explained why people feel so great after sharing kirtan with him. Now, Texans will be in for a treat as the master Bhakta offers a weekend retreat October 19-21 at Ecstatic Dance Dallas. Ricky Tran will host, and lead yoga workshops. “This is a rare opportunity to study with Bhagavan Das, as he seldomly offers this full weekend retreat,” says Tran. Interestingly enough, both Joshua Tree and Dallas are on the mysterious 33rd parallel. Joshua Tree, on the 33rd North Parallel, was once sacred Indian grounds, and still carries much of the sacred feelings. And Dallas? Well, the micro-chip was invented here. But, it’s also Tran’s home, and he’s a wonderful teacher. So, this weekend in Dallas should be very memorable. This entry was posted in Festivals & Events, Kirtan & Bhakti on October 5, 2018 by thenamas. The topic of spiritual practices is by guest author, Pranada Comtois. Her book, Wise-Love: Bhakti and the Search for the Soul of Consciousness is newly published. We are driven for love and by love. We must feel loved to feel whole. But do you feel lovable or loved? Sometimes? All the time? Almost never? You may have a life companion, family, and friends and not feel loved or worthy of love. Or you may be a loner without significant relationships but feel lovable and loved. Loving relationships can go a long way in confirming our worth, countering negative self talk, and making us feel lovable. But they aren’t what make us feel lovable. If we don’t love ourselves – truly, deeply, fully, and with clarity – we won’t feel loved. Even if we surround ourselves with a community of loving people we may still feel unworthy of love. After all, those who purportedly love us can make us feel unloved or unlovable. Their style of relating to us, as well as their own needs and shortcomings, combined with our misperceptions and misconceptions can create untenable situations. Neither can our inner lack of love be resolved by affirmations, creative visualizations, mindfulness, or meditation. We can look ourselves in the mirror in the morning and repeat, “I love you. You’re worthy of love” and still feel unlovable. That’s because we often miss the distinction between mundane love of the false self and divine love of the genuine self. Only in realizing my real self can I experience real love because I’m not the body, mind, or emotions — or the illusory identities associated with this temporary frame I inhabit. Love of the body-mind won’t make me feel whole and satisfied. I require love for myself as a spiritual being. And how can I love our self unless I know my self? But, not all practices simultaneous endow us with self love. This is the promise of bhakti’s divine love, or wise-love. As a spark of spirit, a unit of consciousness, we are a most beloved subject of love. We must be loved to be whole, and we are givers-lovers. Feeling unlovable or unloved is only an imagined state of mind without truth in reality. When we wake to our eternal self we awaken to our enduring nature as lovers who are supremely lovable. When we awaken and see the self, we naturally see the Source from where we are generated, just as when I see a spark of fire, I will also see the fire-source. As a spark of our Divine Other, our nature reflects his. As he is a lover, we are lovers. As he is lovable, we are lovable. We don’t need the confirmation of the world, or current relationships, to validate the existential truth of our lovability; we experience it when we awaken to the self. And more, just as our Divine Other cannot be moved by conditional love, the love of this world cannot fill us. We must have the most exalted, pure love, or wise-love: the unconditional love the self knows for itself and its Source. We easily progress in the art of self awakening by bhakti’s simple method of hearing about and chanting about our Divine Friend. In kirtan or japa (solitary chanting with prayer beads), we can chant the sacred great mantra, the maha-mantra Hare Krishna. Kirtan is the beginning of an amazing journey to the self and wise-love. By associating with our Infallible Lover, our infallible lovability is reflected to us and our love fully reciprocated. The magic of bhakti reveals the lover and her lovability, the Beloved, and their mutual wise-love. Even the beginning experiences of this relationship can alleviate, forever, our feelings of being unloved or unlovable. Pranada Comtois is a devoted pilgrim and teacher. Her writing sheds light on bhakti’s wisdom school of heartfulness. She shares her love for spiritual practices with a focus on how to culture wise-love in our lives and relationships. She hopes others can experience the inherent, unbounded joy of the self. The wisdom of her teaching and spiritual practices grows from living 20 years as a contemplative in bhakti ashrams. For more on Bhakti, click on the Kirtan and Bhakti button at The Namaste Counsel archives. This entry was posted in Kirtan & Bhakti on April 2, 2018 by thenamas. Music is a part of my life. I play no instruments. I’m not a trained musician. But, music is in my heart, and in every cell of my body. That’s why chanting (bhakti yoga or kirtan) is one of the most important aspects of yoga for me. Yes, chanting is yoga. As is dancing. When I was a kid, I felt something special when I would sing with my sister. After seeing “The Sound of Music” and “Mary Poppins,” some of the songs were on automatic replay in my head. I couldn’t stop singing. Now, it’s the same way. But it’s mantras that keep circulating through my heart and my mind. I try to share that appreciation with my students. In classes, even if I’m playing Mary J. Blige or Stephen Marley, I’ll intersperse a rhythmic mantra. Once or twice a year, I go to kirtan festivals. Recently, I was in California for Bhakti Fest. The following weekend I went to North Carolina for Sadhu Sanga. Both were gatherings of several thousand bhaktas. People, like me, that have been touched by the power of sankirtana (group chanting). One of the most beautiful things about Bhakti Fest and Sadhu Sanga is the energy. Beyond the beautiful sounds and rhythms, there is a special atmosphere. Bliss. Devotion. Whatever you want to call it. That’s what bhakti is all about. In fact, one of the translations for bhakti is devotion. When you practice san kirtan that special feeling is magnified a thousand times. Kirtan Fest Houston brings together kirtan artists who travel around the world. Karnamrita Das is one. I’ve sung with her in California. Amala Kirtan Das is a Brazilian-born musician with whom I’ve chanted several times in Austin. In addition to many others leading the group chanting will be San Antonio’s Advaita Acharya Das. He’s my personal conductor. He’s moved my life in many ways. Not just getting me to dance or sing, but to make a difference in my life. To live the principles of yoga. This is your chance to feel the power of group chanting without leaving the big state of Texas. In fact, Advaita is coordinating caravans to get to and from Houston. Advaita quotes the scriptures to explain the value of chanting. Girish is one of the frequent Bhakti Fest musicians. At this year’s Shakti Fest I attended one of his workshops. Kind of like Singing 101. Find your key. The majority of women are most comfortable in the key of A. On the other hand, men usually prefer C.
Relax the jaw, tongue and throat. Try a few lion’s breaths before you start to sing. The dan tien (a few fingers below the belly) is the root of the voice. In Daoist practices this spot is special. It’s where energy brews. A sea of qi (prana). Similar to with yogic breathing, expand the flower pot, beginning here. Similarly, Jaya Lakshmi and Ananda are popular singing yogis at Bhakti Fest. This entry was posted in Kirtan & Bhakti, Sutras & Ahimsa on July 20, 2017 by thenamas. A few years ago, India’s Prime Minister, Narendra Modi made an appeal at the United Nations. As a result, 177 United Nations member states assigned June 21 as a day to recognize the benefits of yoga. International Day of Yoga 2017 will be celebrated around the world. Now, tens of thousands convene for mass meditations and sun salutations. For International Day of Yoga 2017, India’s Prime Minister, senior officials and yoga gurus are expected to lead more than 50,000 people in Lucknow, India. Nearly a dozen events will take place in Delhi. One, in Red Fort, can accommodate 50,000. In Southern India, venues even include a women’s correctional facility. While cities around the world honor this day with special public yoga and meditation practices, the UN will host two days of activities. The Indian Mission to the United Nations is responsible for the impressive lineup June 20 and 21. Among the yogis are California-based Seane Corn, Sharon Gannon of New York City’s Jivamukti Yoga and Gurmukh, who popularized Kundalini Yoga in Los Angeles. Also on the lineup is Swami Sivadasananda, a senior teacher of Sivananda Yoga (my yoga roots). His session, expected to attract 1,500 participants, will be televised in India. Other guests are spiritual leaders from India. President of Divine Shakti Foundation, Sadhvi Bhagawatiji, and H.H. Pujya Swami Chidanand Saraswatiji, who runs an ashram, both reside in Rishikesh. Additionally, there will be discussion on Yoga and Health with World Health Organization officials, Bruce H. Lipton, Ph.D and others. Finally, there will be pranayama, meditation and chanting. Grammy nominated Jai Uttal will lead thousands with his eclectic world rhythms. The event coincides with Jai’s tour promoting his 19th album Roots! Rock! Rama! Named for Bob Marley’s “Roots Rock Reggae,” Jai’s three Rs celebrate Rama (God), reggae and classic Indian ragas. As an extension of his new double CD, Jai released a single, “H.E.L.P.” for International Day of Yoga. California-based Jai returns to New York where he was raised. His father was influential in the music industry in the 50s and 60s. So, Jai picked up an appreciation for the Beatles, Marley and other rock luminaries. Then, in the 70s he studied traditional Indian music. In India, he began his bhakti (devotional) yoga practice. As such, kirtan became the center of Jai’s musical and spiritual life. Multiple Texas events will honor this day. Following, are just a few. International Day of Yoga 2017 at Tripoint Event Center. A free family-friendly festival runs alongside a CME-accredited conference for health practitioners. The Indian Consulate is hosting a celebration June 17 at the State Capitol. June 24, the Hindu Temple of Woodlands will be at Town Green Park leading bhajans (songs), meditation and hatha yoga. The official International Day of Yoga 2017 event is June 25 at Mahatma Gandhi Memorial Plaza in Irving. Yoga mats will be provided, and breakfast served. This entry was posted in Festivals & Events, Kirtan & Bhakti on June 3, 2017 by thenamas. Yoga is everywhere in the United States. You can even buy your blocks and mat at any big box store. But the yoga that is so prevalent tends to be the physical component. In fact, yoga is eight-limbed. Some of those branches may seem a bit obscure. Others, out of reach. However, it’s easy climbing. Especially if there’s a spotlight on them. Add in mega-stages and throngs of people loving their spirituality and you’re on your way. That’s Bhakti Fest. The guy who brought Swami Satchidananda to Woodstock created Bhakti Fest, and its sister, Shakti Fest. Shakti (divine energy) Fest is just around the corner. Set for May 12-14, I booked my airfare last month. The next Bhakti (devotion) is in September. Both have a similar vibe to what I can only imagine was at Woodstock. But, on a much smaller scale. And, following yoga tenets: no drugs, alcohol or meat. As a result, people from all over head to Joshua Tree, California, for these festivals. I’ve made it a priority for many years. It’s my fix. It’s powerful professional development. And, permanent personal development. The festivals are rooted in yoga, Kirtan, and meditation. If you’re not familiar what Kirtan (or Bhakti), read more on my blog. Bhakti and Shakti Fest mesh traditional and non-traditional spiritual practices. They are a smorgasbord for the yogi. I gorge myself on the music, chanting, and Bhakti yoga practices. Oftentimes, sleeping just a few hours under the desert stars. Unlike an all-you-can-eat buffet, you have to make hard choices. Siva Rea or Mas Vidal? Hemalayaa or Michael Brian Baker? Kia Miller, aerial yoga or the Hanuman Chalisa? There are three concurrent yoga sessions (many with live music). Additionally, there are two stages for devotional music. Then, there are five workshop areas including a Family Village, a Men’s Lodge and a Women’s Dome. Plus, aquatic yoga, and holistic health practitioners offering massages and more. For those needing to chill, soak up healing sound baths every evening. Donna de Lory headlines on Friday. For many years, this spiritual vocalist toured with Madonna. Jai Uttal performs in prime time Saturday. Jai’s latest CD is both Beatles- and Brazilian-inspired. Closing out the night is Joss Jaffe about whom I’ve written in the past. Others include Sheela Bringi, Girish, Sirgun Kaur, Prajna Vieira, Johanna Beekman and Saul David Raye. As stated before, these festivals delve into the lesser frequented limbs of yoga. First, there are experts in Vedic astrology and Ayurveda. Other workshops cover Sanskrit and the deities. Plus, advanced meditation and breath work techniques abound. Finally, for many of the guest speakers, instructors or musicians, the branches intertwine. For example Jaya Lakshmi and Ananda are leading three 90-minute yoga sessions. On closing day, they perform on the main stage. Jaya Lakshmi and Ananda are seeped into meditative Kundalini mantras. Nonetheless, they can switch gear into Kirtronica — Kirtan meets Electronica. As such, their workshops aren’t about a child’s pose or Sun Salutation. The Oregon-based yogi/musicians, with 12 CDs, inspire via waves of movement, breath work and sound. Govind Das and Radha are another married couple that blend music with mantras and movement. Their music, Bhakti yoga and intensives have made a mark on me. They are the featured band on closing night. Plus, they are offering three yoga sessions infused with their live music. Additionally, Govind Das hosts a men’s workshop and the couple is holding a post-intensive, May 15. The latter includes dialogue, journaling, dharma talks, a silent meditative desert walk, teachings from the great masters, and the philosophy of Kirtan. And, always in their, plenty of music, mantras and heart-opening hatha flow. Betty and Bill, are frequent Bhakti Fest-goers. The Canadian engineers created their own Kirtan band, Shanti Maya, fueled by satsang at Bhakti Fest, and elsewhere. “You can’t say enough about how beneficial it is for the soul to come into the company of dozens, sometimes hundreds, of people who have gathered with the same goal,“ says Betty. She says Kirtan is a major draw. But, it goes far beyond that. “The music itself is blissful, and all the artists have their own unique musical styles that almost always keep us entranced. We all come in common purpose, and that is to feel safe and enriched in one another’s company,” says Betty. This entry was posted in Festivals & Events, Kirtan & Bhakti on April 30, 2017 by thenamas. In a recent blog, I wrote about Dr. Dream. This is the sound therapy conductor who uses 333 Tibetan bowls. A big fan of sound therapy, I hope to experience the 333 bowl effect next month. Dr. Dream and his team of “angels” will make magical music at Contact in the Desert. Dr. Dream’s bowl sonata will be somewhat of a postlude to a series of nightly sound baths the prior week at Shakti Fest. Coincidentally, they are all at the same sacred space. The common venue is the very special Joshua Tree Retreat Center, about 40 minutes from the Palm Springs Airport. A not-for-profit center, it is the oldest and largest of its kind, in the Western U.S. It sits on many acres, above an aquifer, with buildings designed by Frank Lloyd Wright, and his son. Adding to the coincidences, I was born and raised in Frank Lloyd Wright’s hometown, and my brother mowed the lawn at his studio/home. So, for the last five years, I’ve headed to Bhakti Fest without fail. Now, I am headed to Shakti Fest. No typo. S. Not B. Bhakti is held each September. Shakti Fest is in Springtime. Actually, May 12-15 this year. Despite the fact that Shakti is a more condensed version than Bhakti, one stage will be dedicated to five hours of sound therapy, nightly. 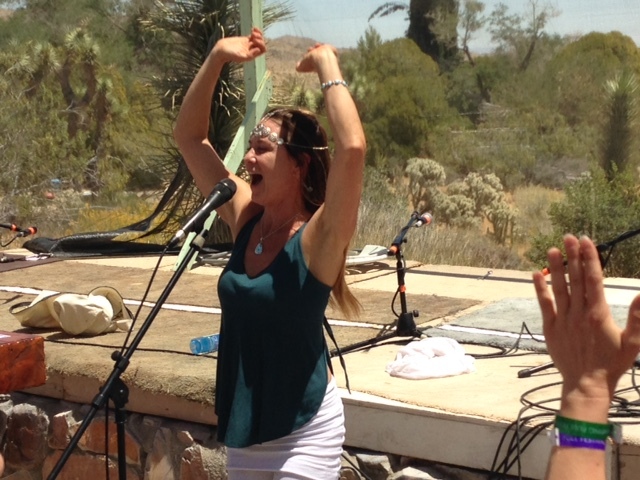 Both Bhakti and Shakti Fest bring the best yoga teachers, Kirtan musicians, and workshop leaders to Joshua Tree. Namely, they celebrate the devotional paths of yoga, Kirtan and meditation. Quite a few of the Bhakti/Shakti workshop leaders have influenced my teaching. Many more are staples on my yoga playlists. Sridhar Silberfein is the man behind Bhakti and Shakti Fests. Interestingly enough, he was also responsible for getting Swami Satchidananda to Woodstock. So musical extravaganzas and spirituality have been with him most his life. As a Certified Yoga Therapist, I have studied many different forms of healing, and try to tap into a colorful palette of modalities when I create lifestyle action plans, homework or protocols for my clients. Sound therapy is most certainly a favorite. I’m not alone. Dr. Oz is a proponent of sound therapy. On one of his shows, Dr. Oz explained how bi-neural frequencies influence the brain. He displayed brain scans of people listening to crystal sound therapy, to point out the positive effects. His guest, Dr. Mitchell Gaynor, gave patient testimonials for sound therapy. Gayor is an oncologist, who uses sound in his practice. “It’s critically important,” he responded, saying that it can help everyone. Dr. Gaynor explained that with sonic therapy, you can improve moods and much more. For those that are in good health, it is a proactive measure. For those battling health issues, the differences are more evident. As an oncologist, he incorporated a 15-minute crystal sonic therapy session into his patients’ first visits. Apparently, it was highly effective. Many said they hadn’t felt that relaxed, ever. For Dr. Gaynor, this was especially rewarding. Especially, considering the first visit to an oncologist is often filled with fear and anguish. Ten different Sound Dome presenters are part of the extended Shakti lineup. Among them is Danny Goldberg. His Sound Immersion Experience “weaves the restorative vibrations of singing bowls, gongs and chimes to create a blanket of healing sounds. The sound provides a channel for release, opening and transformation; tuning our vibrational frequency.” In the past, Danny led healing sessions at Wanderlust, Lightning in a Bottle, Lucidity, UC Santa Cruz and Foothill College Music Programs. Guy Douglas is a sound therapy practitioner with a longtime interest in the healing power of music. A traveling gongmaster, he performs Sound Circle Ceremonies, Group SoundBaths, Retreats, Gong Workshops, Gong Yoga Flow classes and Gong Invocations. His focus is Eastern sound healing techniques that help clear dormant pathways and open the heart. Lynda Arnold is a healing sound recording artist and certified sound healer. She taps into the power of sound therapy to help people reduce stress, and transform consciousness. Lynda was a Sound, Voice and Music Healing student at the California Institute of Integral Studies in San Francisco. Additionally, she studied Tibetan Bowl Sound Healing with master practitioner and educator Suren Shrestha. She holds a certification from the Sound and Consciousness Institute in San Francisco. This entry was posted in Festivals & Events, Kirtan & Bhakti, Therapy & Benefits on April 24, 2017 by thenamas. This week, the object of her immense dedication won a prestigious award. “Shadows of Destiny,” was bestowed a Silver Medal by the Independent Book Publishers Association. One of the most influential associations in independent publishing, IBPA awards recognize excellence in book editorial and design. Well-known yogi, Shiva Rea says Vrinda is an “extraordinarily gifted storyteller” who makes the timeless epic come to life. Vrinda explains how everything fell into place. Vrinda began “Shadows of the Sun Dynasty” from Internet cafes in India. As she was writing the Sita’s Fire trilogy, she earned a degree in English from the University of Florida. She married Vish. They had a baby, and are expecting their second child this July. Now, she has gained confidence as a prolific writer. “Queen of the Elements” will be available August 8. Then, the third in the series will be released in 2019. She acknowledges mom was always right. Vrinda’s mother, Anna Johansson, exposed Vrinda to the ancient tales of the Ramayana at an early age. Rather than tales of Mickey and Cinderella, her parents raised Vrinda according to Vedic cultures and traditions. Stories of Sita and Rama. She learned Sanskrit and basic Hindi. For five years, she lived in India. She mastered traditional Indian dance which guests will appreciate in Austin. Vrinda and Vish make sacred traditional music hip. Likewise, she hopes to be a cultural translator of the tales from India that date back to fifth century BCE. “The Ramayana is a complex, multi-layered epic that has stood the test of time, and is studied by scholars and is being constantly retold by various authors. In India, for example, there are over 200 regional versions. So I’m officially part of this vast and vibrant storytelling tradition. Knowing this actually eased some of my writer’s anxiety, as it was at times daunting to tackle such a beloved story,” says Vrinda. For Vrinda, much of what makes the story so special are the pivotal characters. While Rama is oft-described as a deity, one of the things that endears him to Vrinda is the human struggles he undergoes. “The challenges he faces are ones that any of us can relate to,” she says. Not surprisingly, the female protagonist is Vrinda’s favorite in the fable. To some extent, Vrinda is taking the classic tale and bringing a bit of feminism to the storyline. This entry was posted in Festivals & Events, Kirtan & Bhakti, Sutras & Ahimsa on April 17, 2017 by thenamas.